It's also not possible to connect subsites or the "/sites/ContentTypeHub" site to new Office 365 Groups. After connecting to a group, the existing team site keeps the same URL, settings, and permissions. The administrator can then add other owners and members to the connected group. 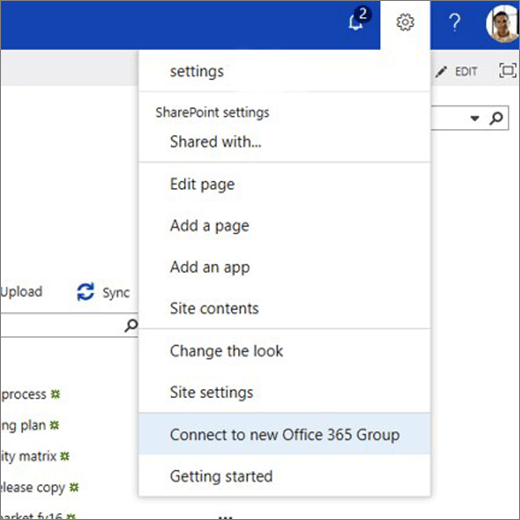 If your SharePoint admin enables this feature, site owners can start the process to connect to a new Office 365 Group. 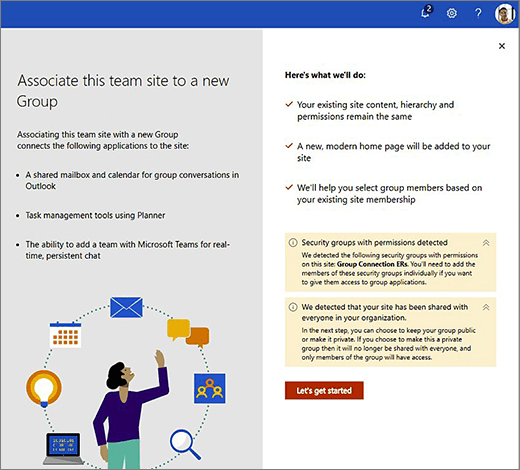 For more information, see Allow or prevent site collection administrators from connecting classic team sites to new Office 365 groups. When an existing SharePoint team site is connected to a new Office 365 Group, its URL, settings, and permissions don't change. This means that site owners, members, and visitors can continue to work without interruption. While existing pages aren't automatically updated, you can begin to modernize your team site. This means that your existing pages aren't changed but a new modern team site home page is added. A link to the previous home page is added to the site's navigation under "Home" in the left navigation bar. This link to your previous home page is there if you want to move any customizations to the new modern team site home page. Additionally you can create new pages and even make one of these new pages the home page of your site. 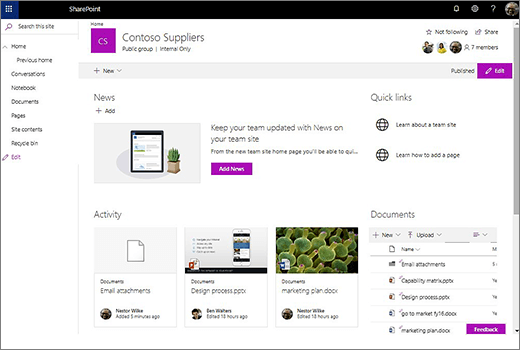 For more information, see Work better together with SharePoint team sites Office 365 app integrations and Learn about Office 365 Groups. Open the Settings menu in the top suite navigation header, and click Connect to a new Office 365 Group. The group creation experience appears. Optionally, update the group name and email alias, and select the group's privacy and classification (if enabled in your tenant). Then click Connect Group. For more information about group creation and settings, see Learn about Office 365 Groups. 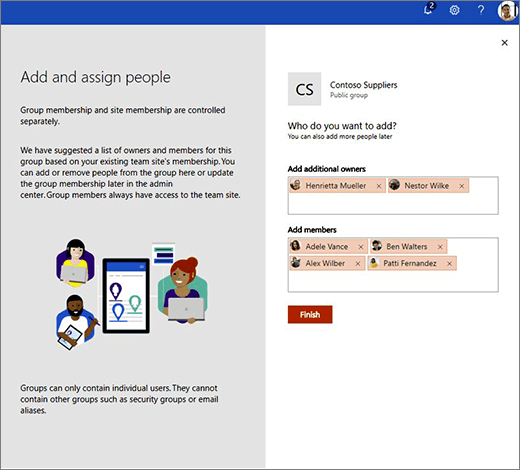 Note: When there are security groups in the team site that you connect to an Office 365 Group, a warning appears that says you need to add each member individually to the new group members. This provides these members access to other group workloads. The Add and assign people panel appears. This is a proposed list of owners and members, based on an inspection of your existing site. You can add new owners and members, or remove people from the proposed lists. Click Finish when you're done. The New site Home Page appears. You can manage your new group's membership at any time. Site permissions and group membership are managed separately. Group members always have access to the team site, however the team site itself can be shared with additional users who are not group members. These groups support nested membership, such as Azure Active Directory groups or Office 365 Security Groups. These roles do not support nested membership, such as Azure Active Directory groups or Office 365 Security Groups. When you add users to these roles, they are automatically added to the related site collection permission groups: group owners become site owners and group members become site members. The site collection administrator that connects the team site to a new group becomes an owner of the group. 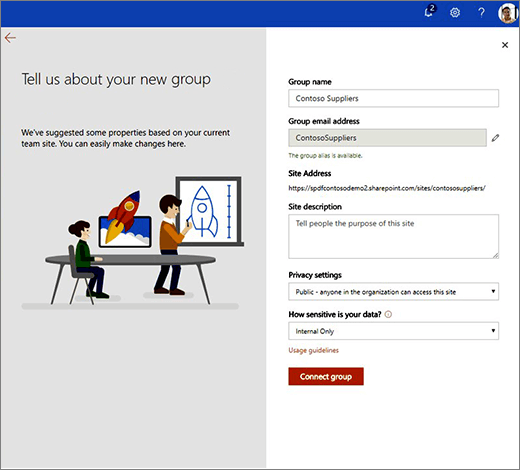 SharePoint Online will suggest users to be added to the Group Owners and Group Members group based on the site's current users. If the site permissions groups contain security groups or Azure Active Directory groups, SharePoint Online is not able to suggest group members based on the contents of these groups - you must add these users to the group manually. Any new group members you specify are added to the associated site collection permissions groups - Group Owners are added to the Team Site Owners group, and Group Members are added to the Team Site Members group. These changes are made at the site collection level. If you have subsites and you have broken permissions inheritance, your permissions model remains unchanged. Permissions filter down from the site collection level according to the model that you created, including the new group owners and members. If you set the privacy level of the new group to Public, then everyone in your organization - except external users - will have Group Member access to the group. You can use the Modernization Readiness tool to generate a report about the site collections in your tenant and includes information about the sites that are ready to be connected to Office 365 Groups. The report will also identify those site collections that might need attention prior to connection to Office 365 Groups.